What an exciting month April has been for MarketPlace! We were delighted to have eight creative style bloggers agree to collaborate with us on styling items from the spring line and offering a gift card giveaway to their readers. It was a pleasure working with all of these women, and their enthusiasm, support and positive energy were infectious. We couldn’t feel more grateful that they all put together such beautiful posts about their chosen MarketPlace pieces that we can now share with you. If you are curious about new ways to style some of your MarketPlace blouses or tunics, here is a little inspiration! 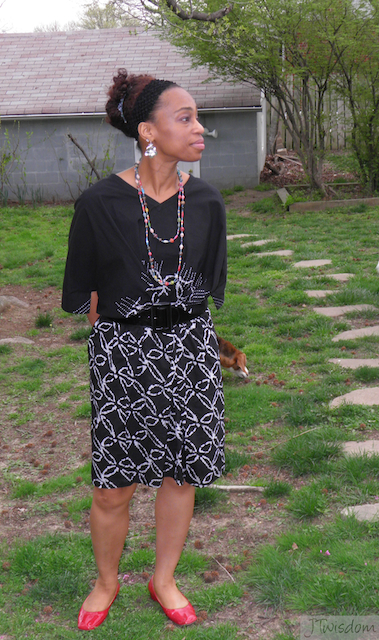 Tamaki of Bubbling with Elegance and Grace styled her Irla Dress two ways. Her first look is simple, elegant, and perfect for the office with a black patent belt and some black wedges. If you want to add a dash of color, you can choose bright shoes and a colorful necklace as Tamaki did in her second outfit. Serene of The Elegant Bohemian also went for a simple look with her styling of the Nafisa Tunic. Its relaxed silhouette pairs well with some jeans for a weekend look, and it doesn’t need much more adornment besides her bangle and assortment of black necklaces. All together Serene makes a subtle but beautiful statement! 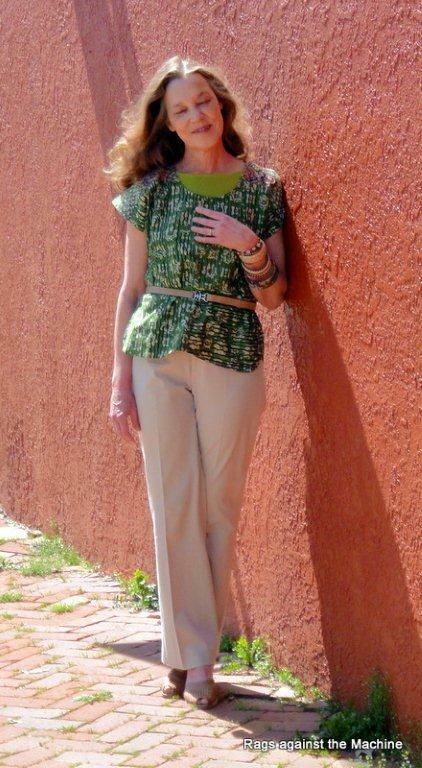 Like Tamaki, Anne, of the humorously named The Frump Factor, put together two different outfits with her MarketPlace Smita Top in spring green. With a belt and some heeled shoes, Anne’s first outfit is a little dressier than the second, and we love how she chose to highlight the colors of the stitching by wearing necklaces that match perfectly. In our opinion, you can never really have too much color! If you’re ever wondering how you could style your MarketPlace tunic for both dressy and casual, then you must check out Pam’s outfits with her Agra Tunic. On Over 50 Feeling 40, Pam paired her tunic with a black jacket, wide belt and black trousers for a more business casual feel. She also chose to accessorize with sparkly red shoes that ever so subtly pick up the red stitching in the neckline of the tunic. Once it’s Saturday morning and you’re not quite ready to wear something more serious than leggings, Pam’s second outfit has you looking put together enough for everything from a trip to the grocery store to a leisurely walk around the neighborhood. If you click through to her site, you’ll get to see just how fancy her leggings really are! On Rags Against the Machine, Terri’s pairing of sharp khaki trousers with her Smita Top makes for a classy and colorful combination. The belting of the tunic reminds us of the very on-trend peplum look for this summer. Couldn’t you see wearing this to the office or to a nice dinner with friends? Reva of Reva’s Rags 2 Roses fashioned the Agra Tunic in a whole array of styles! Reva offers inspiration for five different outfits: Artsy-Fartsy, Bohemian, Weekender, Tidy Office and Indie. For any mood that strikes you or any day of the week, Reva shows that the Agra Tunic can work for you. You can see them all on her blog, and we’ve included our favorite (Bohemian!) below. Heather of The Style Confessions put together a glamorous styling of the Agra Tunic for her picnic in the park, a look that would translate seamlessly into the evening as well. We love her combination of textures and patterns with her wide brimmed hat and flowered scarf to create a creative and visually appealing outfit. We would stroll through the park all day in Heather’s look. On Made to Travel, Jamillah made her Smita Top work for three weekly events. She styled the blouse for a girls’ night out (pictured below), a day at the office, and a lazy Sunday. We are in love with all three looks and are impressed at how the Smita Top integrates so well into each look while also being an excellent statement piece. Luckily for you, you still have a chance to enter her giveaway of a $100 gift card to MarketPlace! The giveaway runs through 11pm on May 4th, so be sure to enter! 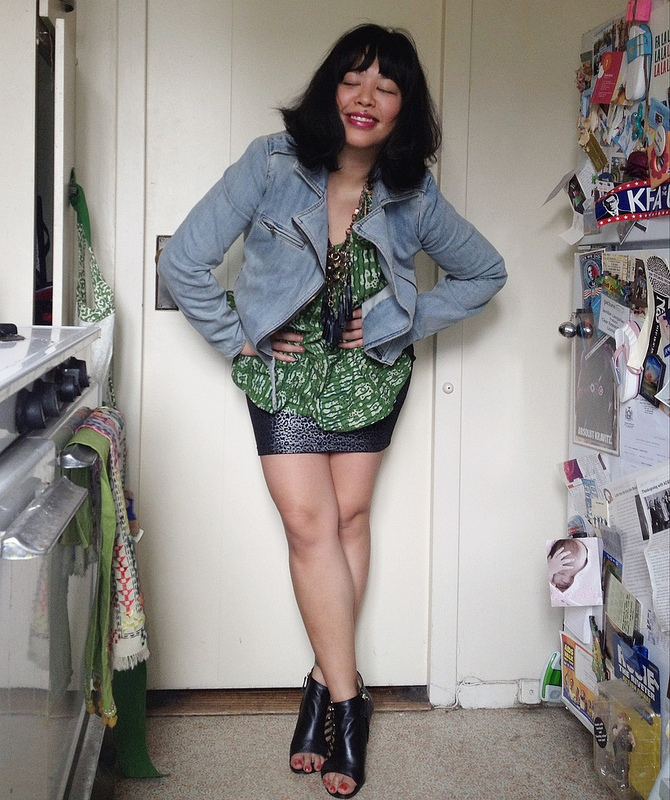 Our final fabulous blogger to collaborate with us is Bella of The Citizen Rosebud. She is a funky, colorful and generous blogger, and we cannot wait to see how she styles her Amrita Jacket. She will also be having a MarketPlace gift card giveaway, so don’t forget to check out her blog again between April 27th and May 4th. We owe a huge thank you to the nine inspiring bloggers who collaborated with us. We were touched by their enthusiasm for the MarketPlace brand, and we were so excited to see all of the different looks that they were able to put together. We hope that you readers are equally as inspired as we are, and we’d love to see how you wear some of your favorite MarketPlace garments. Check us out on Facebook and share your MarketPlace style! Previous Post: Picnic for Artisans’ Day!